You can create new invoices from an existing template or from scratch. This topic provides instructions for both methods. You have added the necessary invoice items to the application. If you are missing any invoice items, you need to add them first. Go to How to add an invoice item. Then, return to this procedure. The customers for whom you are creating an invoice are listed in your Customer list. If you need to add a new customer, go to How to add a new customer. Then, return to this procedure. You previously created and saved the template you want to associate the invoice with. If you need to create a template, go to How to create an invoice template for instructions. For recurring invoices, we recommend you create and save a template to save time. 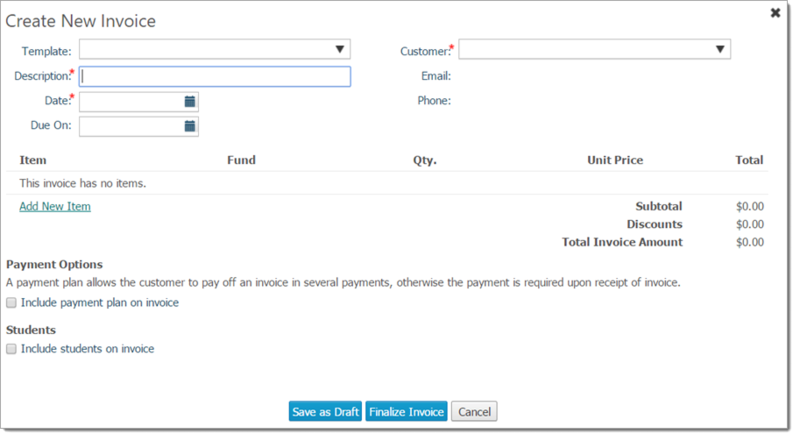 To associate the invoice with an existing template, select the desired one from the Template dropdown list. The application displays a message asking you if you want to load the template. Click OK to load the template. The application loads the details in the selected template into the new invoice form. If the Description field is blank, type a description for the invoice. In the Date field, click to open the calendar widget. Select the date of the invoice. This is the date you want to appear on the invoice. It does not have to be today's date. In the Due On field, click to open the calendar widget. Select the date the invoice is due. If you are creating an invoice for a single customer, select the name from the list. Then, click Close. The software loads the name of the customer into the Customer field. Contact information displays under the customer's name. If you are creating the same invoice for multiple customers, select their names from the list. Then, click Close. The software loads the names you selected. The Customer field indicates that multiple customers were selected and shows how many. In the Item dropdown list, click to display the list of invoice items. Select the desired item from the list. The software shows the unit price of the selected item and updates the invoice total based on the newly added item. To include a payment plan on the invoice, complete the following: A payment plan allows the customer to pay the invoice in installments rather than in one lump sum. In the Payment Options section, select this checkbox: Include payment plan on invoice. Enter the details of the payment plan into the displayed fields. An asterisk (*) indicates required information. The software calculates the number of payments and installment amounts based on the details you provided. In the Students section, select this checkbox: Include students on invoice. From the Term dropdown list, select the school term. A list of students in the selected family is displayed. Select the checkbox next to the name of each student you want to include on the invoice. Click Save as Draft. A message is displayed to inform you that a draft was successfully created. Click Close to exit the message and return to the Invoices page. The invoice you created now appears in the Invoices grid. The Status column shows Draft as the status. You can edit an invoice that is in draft status. If the invoice is ready for billing, follow these steps: After you finalize an invoice, it is locked and can no longer be edited. You are prompted to confirm that you want to finalize the invoice. Click OK to confirm. The software displays a message to inform you that the invoice was finalized. The status of the invoice is set to Ready. The invoice you created now appears in the Invoices grid. The Status column shows Ready as the status. The finalized invoice can no longer be changed. ● You have added the necessary invoice items to the application. If you are missing any invoice items, you need to add them first. Go to How to Add an Invoice Item. Then, return to this procedure. ● The customers for whom you are creating an invoice are listed in your customer list. If you need to add a new customer, go to How to Add a New Customer. Then, return to this procedure. Click Invoices to display the Invoices page. To associate the invoice with an existing template, select the desired one from the Template dropdown list. Click OK to load the template. If you are creating an invoice for a single customer, select the customer's name from the list. Then, click Close. The software loads the name of the customer into the Customer field. Contact information appears under the customer's name. If you are creating the same invoice for multiple customers, select the names from the list. Then, click Close. The system loads the names you selected. The Customer field indicates that multiple customers were selected and shows how many. In the Item dropdown list, click to display the list of items. Select the desired item from the list. The system shows the unit price of the selected item and updates the invoice total based on the newly added item. If you want to include a payment plan on the invoice, do the following: A payment plan allows the customer to pay the invoice in installments rather than in one lump sum. Enter the details of the payment plan into the displayed fields. An asterisk (*) indicates required information. The system calculates the number of payments and installment amounts based on the details you provided. From the Term dropdown list, select the school term. A list of students in the selected family is displayed. Click Save as Draft. The system displays a message to inform you that a draft was successfully created. Click Close < to exit the message and return to the Invoices page. The invoice is listed in the grid. The Status column shows Draft as the status. You can edit an invoice that is still in draft status. Click Finalize Invoice. You are prompted to confirm that you want to finalize the invoice. Click OK< to confirm. A message is displayed to inform you that the invoice was finalized. The status of the invoice is set to Ready. The invoice is listed in the grid. The Status column shows Ready as the status. The finalized invoice can no longer be changed.